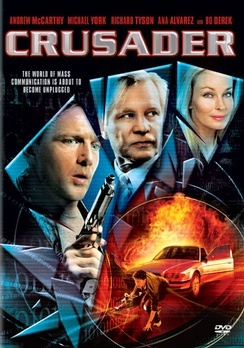 Crusader is another good film from Bryan Goeres. He's 4 for 4 because of this,Art Heist,(2002), Face Of Terror (2004), and Phase IV (2002). 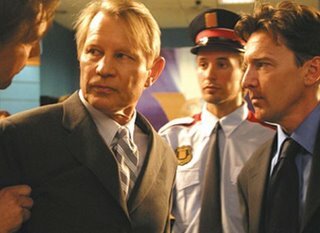 The plot is about Hank Robinson (McCarthy) who is a reporter for a local news station in Spain. He inadvertently gets footage of a massacre at a powerful computer company. After that he is hired to be a top reporter for VisionTV run by Archie McGovern (York). Hank gets assigned other stories by Nicola (Derek) but the story that got him into the big time turns into a battle of deceit, double-crosses and murder. Andrew McCarthy does a good job, Michael York puts in a fun performance and even Bo Derek is okay. There's a lot of action and suspense to definitely warrant a rental.